Bedford Place, Southampton SO1 2BE. Phone (0703) 26235. 5 Millbrook (Wimpson Lane), Western Hospital, Shirley, General Hospital, Lordswood, Sports Centre, Hill Lane, Northam, Bitterne, Butts Road, Wrights Hill, Woolston. 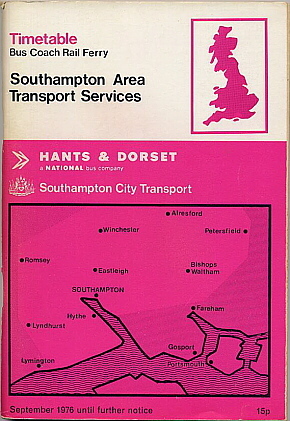 7 Floating Bridge, Docks, Queensway, City Centre or Royal Pier, High Street, City Centre or City Centre - then Town Junction, Central Station, Shirley, Maybush, Aldermoor. Return journey as 7 / 7A / 7B. 9 Floating Bridge, Docks, Queensway, City Centre or Royal Pier, High Street, City Centre or City Centre - then Town Junction, Central Station, Shirley, Shirley Warren, Aldermoor or Lordshill. Return as 9 / 9A / 9B. 10 Octavia Road, Swaythling or Highfield. 11 Royal Pier, City Centre, Town Junction, The Avenue, Lodge Road, Portswood, Swaythling, Burgess Road, Glen Eyre. 11A City Centre, Town Junction, The Avenue, Winn Road, Portswood, University, Glen Eyre.